Compare your own practice patterns to the national average. Here's how. In an era of increasing transparency in medicine, the Centers for Medicare & Medicaid Services (CMS) has been publishing data annually on payments to individual physicians since 2014. The database, officially called the Medicare Provider Utilization and Payment Data: Physician and Other Supplier Public Use File, has been a window (albeit a cracked and opaque window) into the practice patterns and reimbursement of individual physicians. It includes most payments for services covered under Medicare. For each physician and billing code, the database provides the number of services provided and the total amount of money reimbursed for that particular service. You can download the dataset directly from the CMS website. However, the full dataset is a bit unwieldy. You can also use CMS’s interactive dataset to easily filter the data by different variables, and download a subset of the database. In addition, many websites, including the Wall Street Journal, and ProPublica, have created searchable databases where you can look up Medicare reimbursements for your doctor or any other physician. The reception to the publication of the physician database has been mostly positive, and I anticipate that CMS will continue publishing this data on an annual basis. There are several questions that can be answered using the database. If you are an internist, you can compare your own practice patterns to the national average. 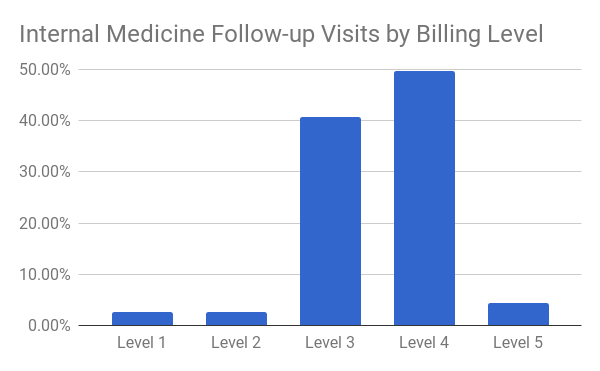 If your billing practices are significantly less than the national average (e.g., billing most of your follow-up visits at level 2), then it might be worthwhile to investigate your documentation patterns and see whether you can get higher reimbursement by appropriately billing and documenting your office visits. Second, the Medicare dataset allows researchers, the media, and the general public to identify any outliers in practice patterns. The annual publication of this data may deter some physicians from significantly deviating from standard medical practice, as their Medicare payments data will be published annually. Potential Medicare fraud could also be investigated by journalists or the government. While fraud cannot be definitively proven based on this database alone, suspicious billing patterns can be identified and investigated. Not surprisingly, however, there are also several limitations to the database. If you are not careful, you can easily make incorrect conclusions from the data. The major limitation is that the payment data only includes Medicare patients. Don’t expect too much data on pediatricians in this dataset. Even within an individual specialty, there may be different practice patterns that limit direct comparison between individual physicians. One example would by emergency physicians who work primarily in non-hospital owned free-standing emergency centers, which do not accept Medicare insurance by regulation. Therefore, a direct comparison between a hospital-based emergency physician and a non-hospital owned free-standing facility emergency physician would be inappropriate. Another limitation of the dataset is that the Medicare payment dataset does not account for the overhead costs of delivering procedures. For example, Medicare may reimburse $350 for a vaccination, but it might cost the physician $300 to buy the vaccine. The database will show that the internist was “paid” $350 for the vaccination, but the take-home pay for the physician for administering the vaccine was far less. On the other hand, there are no significant additional costs for a follow-up visit other than the regular fixed costs of running a practice. Therefore, the Medicare payment dataset does not distinguish between high-overhead and low-overhead procedures or specialties. Specialists who perform a lot of high-overhead procedures, such as ophthalmologists or radiation oncologists, will have higher Medicare reimbursements than physicians who mostly bill for office visits. In medicine and in business, revenue does not equal profit, so comparing physicians in other specialties, or even within the same specialty, would be an apples to oranges comparison. For information about physician compensation, you’d have to look at salary surveys, which provide data at a specialty-wide, not individual provider, level. There was a lot of pushback regarding this dataset, and the American Medical Association was strongly against its publication. They argued that the data could be easily misinterpreted by the media and the general public. However, if the dataset is interpreted correctly and the limitations of the dataset are understood, then I believe it provides a valuable service to the public.